Sep. 1, 2017 11:00 a.m.
Oak Bay resident Stefan Dollinger always loved languages. He spent hours and hours in the depths of the Vienna University Library, studying the origins of modern language, and more specifically, English. In early 2000 though, the Austrian-born lexicographer and University of British Columbia English department professor stumbled on what seemed to be a bible – or more so a linguistic map – of the Canadian language: the Dictionary of Canadianisms on Historical Principles (DCHP) circa 1967. “Lots of people who are in languages and literature, they don’t really know about it yet,” said Dollinger, adding that as it happened, he was also writing his PhD dissertation on early Ontario English, (ironically not on lexicons). It wasn’t until 2005 conference in Toronto when the idea of someone revising DCHP surfaced. Dollinger eagerly stepped in, and Nelson, DCHP’s original publisher, approached him for what would take nearly a decade, $300,000 and 43 talented students to create what is now known as DCHP-2. And, unlike online sources telling the origins of Canadianisms, Dollinger and his team’s approach is meticulously processed. “There are lots of lists online that talks about Canadianisms, Canadian words and meanings, but they’re not very good… this has been a scientific approach towards geographical variation in English,” he said. They didn’t just look at Canadian sources, either, but at American and British, New Zealand and Australian language pools for reference. Dollinger added 1,002 new head words and roughly 1,300 new meanings, with a total of around 11,000 head words and 14,500 meanings. The first ‘67 edition of DCHP was also digitized for easier access. DCHP is not necessarily for immigrants and newcomers either, but a lingual source rich with history. There are some revealing, if not startling, entries. For example, the term “canuck” originates from the Hawaiian kanaka ‘man’ and was used in discriminatory and racist contexts, as well as describing a French-Canadian individual. Canuck took a lighter meaning in 1945, when a Vancouver hockey team, the Vancouver Canucks, was formed, and remains today as the most frequent use of the word. Still, the reality is that language, and indeed Canadian English, is constantly evolving. The project doesn’t stop here, either. Dollinger is planning on a possible DCHP-3, and mulling to maybe fundraise a print edition of DCHP-2. 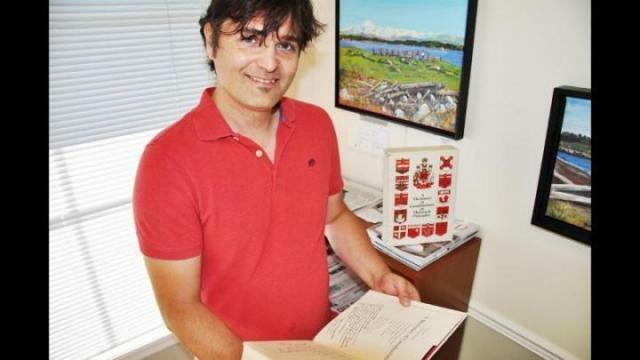 This year, he will work with University of Victoria’s archives of the first-edition of the English dictionary to compile a book on the making of Canadian English.